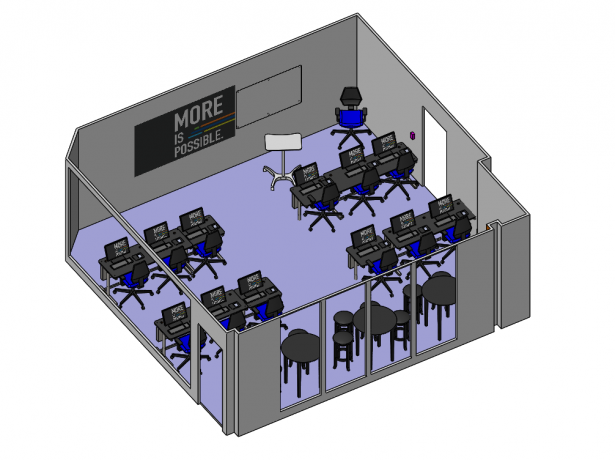 If you have been following the blog you may know that we are preparing to renovate our training room and have been using SOLIDWORKS to assist with the task! 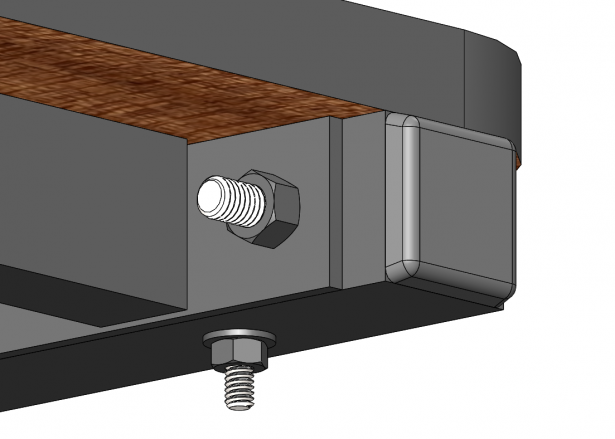 Last time, I used 2019’s new Large Design Review to add components and mate them in place with magnetic mates functionality. It worked well for me, but now I need to fully resolve my assembly. What are the things I can do to predict and prepare for any performance remissions in the software? We can see two outliers immediately: DESK72 and DESK30. They are two variations of the same desk, so both are practically the same component. By a huge margin, these components dwarf all other components in number of graphics triangles. So, why do these components have a large triangle count? Let’s get them open and have a look. At first glance, nothing seems out of the ordinary, but zoom in to any corner and the issue is apparent…there is a lot of detail orientation here. This desk has been modeled with near perfect characteristics. All the screws have actual geometric threads (which takes a bunch of triangles to represent) and there is a representation of every end cap and every decorative piece of plastic. Let’s suppose that this level of detail is necessary (maybe we need to fabricate a copy of this desk in its entirety and need a cut list). Are we out of options? Well, turns out there is a way to get both an exact copy and a simplified version of this desk without having to do a lot of work. Let’s Check Out the 2019 Enhanced Defeature Tool! As the name implies, the Defeature Tool takes a component and greatly simplifies it. It’s extremely beneficial, not only in performance increases but also in protecting intellectual property (i.e. remove all internal mechanisms). 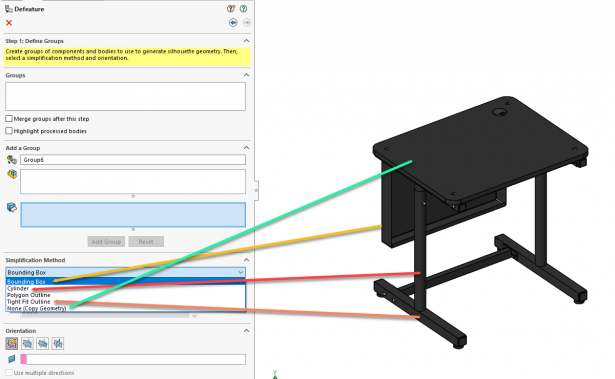 To use it, I’ll go back to the assembly and isolate one of the desks by right clicking the desk in the Design Tree > Isolate. This makes it easier to see what’s going on. Next, I’ll go to Tools > Defeature to launch the tool. When the tool launches the option to choose the defeature method appears. 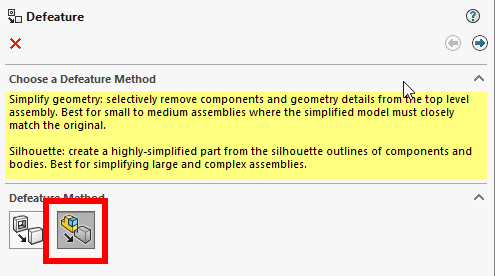 The method that was added to 2019 is the second option Silhouette. It offers a whole new way to simplify components versus just suppressing features. Once that is selected, hit the Next arrow on the top right. Have a body that needs to come out unchanged? Choose None (Copy Geometry). Have a tube? Cylinder is probably your best bet. Prismatic shape with a couple of bosses? Tight Fit Outline sounds ideal. 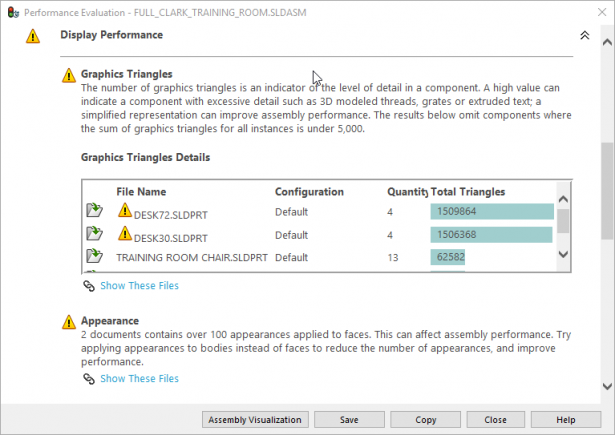 We can perform a File > Replace Components on all the files involved to improve the assembly. From this preview, its almost impossible to see that these parts have desks that have been defeatured. The desks went from having 1.5 million triangles to 5600 triangles, a reduction of over 265 times. I cannot express how valuable this is when working with large assemblies. Hopefully, you have found this helpful and thank you for reading! Check out more blogs like this one here. You’ll find helpful articles and educational videos on a wide range of engineering and manufacturing topics to help you maximize efficiency in your job role! And don’t forget to follow us on Facebook, Twitter and LinkedIn to stay up-to-date on our latest blogs, videos, promotions and more! DesignPoint is passionate about building solutions that help product design, engineering and manufacturing companies maximize their potential. By developing trusted partnerships, we help our customers achieve game-changing results and support them in their journey as they strive for more. 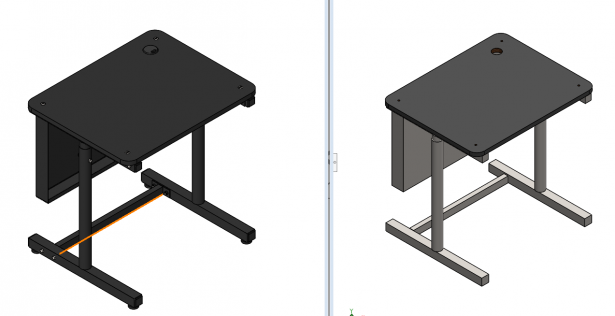 With DesignPoint, More is Possible.® Our solutions include SOLIDWORKS 3D software, 3D Systems and MarkForged 3D printers, technical support, training and more. Contact us today at design-point.com!